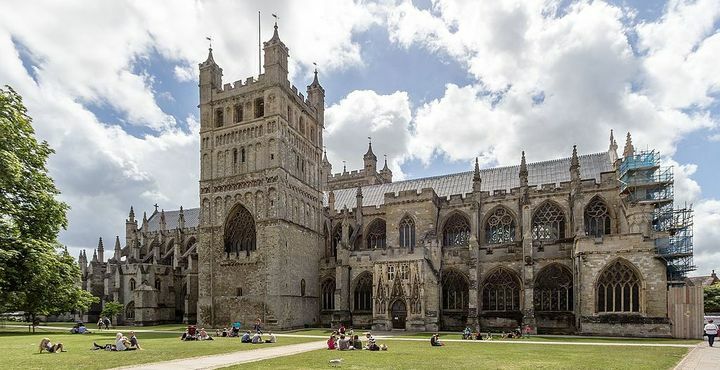 If you are looking for things to do in South Devon, then a trip to Exeter needs to be on your list. An impressive and historic cathedral city, there’s so much to do we would struggle to tell you everything! Langstone Cliff is one of the friendliest hotels in Devon, and central to lots of fun activities so we’re going to try and tell you as many activities as possible – you can read some of our suggestions below. As we already mentioned Exeter Cathedral, it wouldn’t be right to leave it off the list. Boasting impressive gothic architecture and a welcoming atmosphere, whether you are spiritual, religious, visual or a sightseer, you will want to see this vast building for yourself. There’s always something happening; from services and exhibitions to performances and other interesting events. You can continue your educational trip by visiting the Bill Douglas Cinema Museum, a space that is dedicated to how we think of and experience moving images. The contents of this intriguing space date from the present day all the way back to the 17th century. If history is your thing, then don’t forget to stop by the Royal Albert Memorial Museum. With 16 galleries and 3 special exhibition spaces, you’ll be surprised at how much there is to absorb from pre-history to today. For something more daring, why not visit the Underground Passages? Unique in that they are the only passages of this kind open to the public in Britain, you can explore a real piece of Exeter history. Alternatively, Exeter’s Red Coat Guided Tours are the perfect way to learn more about Exeter for free. Once you’ve been a tour, don’t forget to stop by the Exeter Custom House Visitor Centre. Everyone loves a spot of retail therapy, from Mum and Gran to the kids and their friends; whatever you are in the mood for, Exeter is a treasure trove for shopping. From Princesshay to Guildhall, you can find a whole host of boutiques and independent shops as well as big names in Exeter High Street there are many cafés and restaurants. Gandy Street is your destination if you are looking for gift shops, whereas Fore Street has arcades and a quirkier, more local feel. For a local bite to eat, head for Bedford Street at the end of Princesshay, the food court in the Guildhall, or try Magdalen Road for a selection of cafés and restaurants. Exeter Quayside also offers a selection of places to eat and drink down by the water. A holiday with family can often be a juggling act of keeping everyone happy. If you have children, then you will want to keep them entertained during your visit to Exeter – we have the solution. Go Ape in Haldon is suited to cheeky monkeys! If they can brave the heights, they can explore the trees and test their bravery using zipwires and platforms. Crealy is a much-loved local attraction that offers more than 60 rides, 100 animals and 75,000 square feet of indoor soft play. For a more relaxed end to a day spent in the centre, why not head to Board for a drink and a board game or two with the ones you love most? Other kid-friendly attractions include iBounce Trampoline Park, GoSegway and Saddles and Paddles. We know, we know – the weather in the UK can unpredictable at the best of times. If the skies turn grey, we know just what to do; head to one of Exeter’s many theatres or cinemas. Northcott Theatre is Exeter’s flagship professional theatre. They offer a varied programme of drama, opera, music, dance, comedy and family theatre. There really is something for everyone! Alternatively, independent and charity run Barnfield Theatre can be found in the city centre housed in a building that dates from 1890! For something more mainstream, Exeter PictureHouse shows a range of films that are sure to turn a washed-out day around or you can visit Exeter Tenpin for some all-weather bowling fun. If competitive sport is high on your list of activities, then be sure to check the listings for both Exeter Racecourse and the Exeter Chiefs before your visit. There’s nothing like discovering a new team or a new favourite player – if you like football then don’t forget local team The Grecians at Exeter City Football Club. You could soon find yourself in the stands, cheering away! We already mentioned that we are one of the most active, family friendly hotels in Devon – and it’s a reputation we love! When you stay at Langstone Cliff, we have a whole host of activities that you can enjoy including golf, swimming, bowls, snooker and tennis. Away from the hotel and in Exeter specifically, you can attempt the South West’s largest indoor climbing wall, explore the Exe Estuary by bike or discover the Haldon Forest Cycle Trails. For the grown-ups, you can even hop behind the wheel for a thrilling Land Rover Experience. From walking and cycling to water sports and everything in-between, Exeter is the perfect destination for an active family. For something a little different, you could even try Exeter’s Escape Rooms. You can find out lots more by downloading the Official Visit Exeter Guide. We hope our list of Exeter-based things to do in South Devon has been helpful. If you want to join us at our hotel, book direct for the very best rates.